Being the Carb-Lover that I am, I love pasta, so I have tried my fair share of fettuccine alfredo recipes. 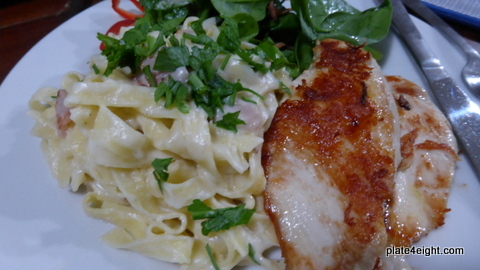 But this recipe is by far the most Amazing Fettuccine Alfredo I have ever tasted. Mr 8 and the kids couldn’t get enough of it. I chose to serve it with a seasoned, grilled chicken breast and a green salad, but it would be perfect served all by itself. Cook the pasta according to package directions, omitting any added salt or fats. Drain pasta, reserving 1/4 Cup of the cooking water. While the pasta is cooking, cook the bacon in a large non-stick pan over medium-high heat for approx. 4 minutes, or until crisp, stirring occasionally. Remove bacon from the pan, reserving the drippings. Add the garlic to the pan and saute for 1 minute, stirring constantly. Sprinkle flour over the garlic and cook for 30 seconds, stirring constantly. Gradually add the milk, still stirring and cook for 2 minutes or until the mixture becomes bubbly and slightly thick. Reduce the heat to low and gradually add the cheese, stirring until the cheese melts. Return cooked bacon to the pan. Stir in the salt and reserved 1/4 cup of cooking water. Add hot pasta to the pan and toss well to combine, ensuring the pasta is completely coated in the sauce. Sprinkle with parsley and pepper and serve immediately.